Dior has reformulated their iconic mono eyeshadows to provide even more colors, finishes and amazing textures. Diorshow Mono, the eyeshadow used by the Dior makeup artists, was inspired by the fabric textures of the brand's fashions - matte, silky, ultra-glittery and metallic - and features super-saturated hues to deck the eyes in long-lasting colors with radiant finishes. 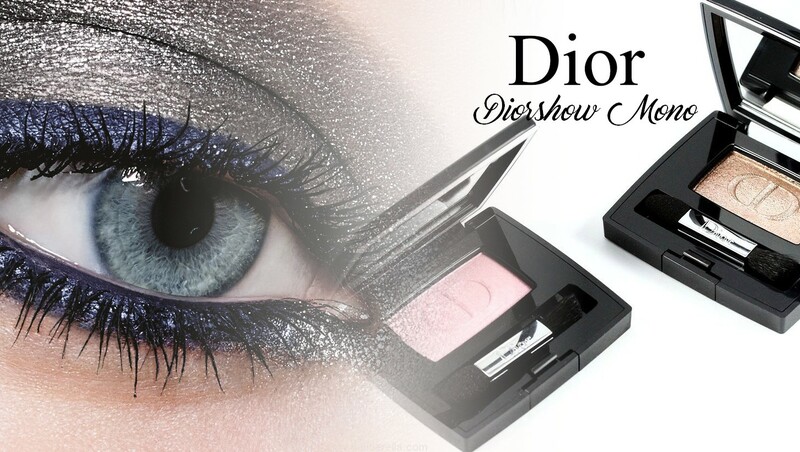 The new Diorshow Mono eyeshadows has just been release and are part of the permanent range of Dior products. Here are the different colors availble in Europe/Middle East. I received shade 826 Backstage and so loved it that I also bought 658 Cosmopolite! The new Diorshow Mono eyeshadows exist in 4 different finishes: matte, silky/iridescent, ultra-glittery and metallic/lamé. I had the chance to swatch the colors in store and they all are really pigmented (except 616 Pulse, which is more glittery if I'm not wrong) and super easy to blend. The texture is really soft and it's like it's melting on contact with your skin. 826 Backstage is a light iridescent pink with cool undertones and a satin finish. You can either wear it as an inner corner highlighter or all over the lid if you use it wet and pack it on with a dense brush. I'm sorry the iridescence is hard to see on pictures but it makes this eyeshadow look really interesting and brings light to your eyes. It makes them pop and look fresh and youthful. 658 Cosmopolite is a deep coppery brown with a lamé finish. The finish of this one is quite unique! I was impressed when I swatched it in store because i) it's super pigmented, ii) it has a metallic finish that catches the light beautifully, iii) it's really deep and intense, and iv) it has lots of light gold sparkles in it. Normally most sparkly shades tend to have a week pigmentation but this is not the case with Cosmopolite. This is a shade I highly recommend to check out. It's so intense, it's almost crazy. Pictures don't do it justice, believe me. It's definitely a favorite of mine and a must-have in my opinion! I must confess that since I got it last Monday I've used it everyday! So yeah, good job, Dior! Both shadows I tried are easy to work with, they glide on easily and can be blended with no effort. I've worn both of them for about 10 hours (using primer) and they were still there when I removed them in the evening. Dior products can be purchased from your regular Dior counter (e.g., Sephora, Selfridges, Nordstrom) or directly through dior.com. In Switzerland you can find them at Manor, Douglas, Marionnaud, and Jelmoli and for example.